Grout is the one reason that keeps people from loving their stone and tile floors. But, grout does not have to be an issue. 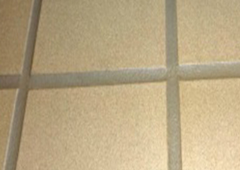 Residential Express has a grout colorant process that will restore your grout to the color you want it to be. It will also give the grout a stain resistance so that you no longer have to worry about every little thing in regards to the grout. Residential Express is the best tile and grout cleaning and restoration company in Central Florida and the Winter Garden area. We've been using Residental Express for almost two years now and they always deliver a first class service -- and always with a smile. We're dealing with a 10 year old carpet in my daughter's townhome and it looks good as new. And what a difference truly clean grout can make! I work with Realtors and homebuyers in the Orlando area and Residential Express is always on my list of recommended services! I work for a business that uses Residential Express Carpet & Tile Cleaning and have seen the 'before and after' results. It is amazing what a difference it makes to have the floors cleaned professionally! Not only do they do an excellent job, but when we recently needed emergency cleaning done on the weekend, he was there within the hour to clean up after a flooding accident. I would highly recommend this business to anyone who needs carpet and tile cleaning! Residential Express Carpet & Tile Cleaning achieves a level of clean not possible with DIY methods. They are very professional, honest, and reasonably priced. I wouldn't think of calling any other company to come clean my carpets and rugs, tile and grout, car interior, and mattresses.